Only showing entries about aegean from Destino Infinito. View entries about aegean from all Travellerspoint blogs. 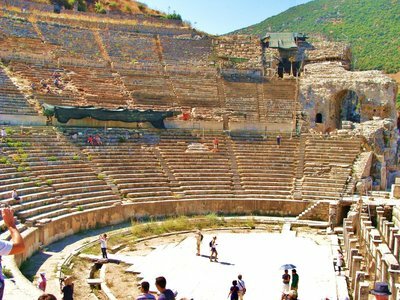 Just a short journey away from the Aegean resort of Kusadasi lay the most impressive ruins I have ever seen. ‘Ruins’, at times, is actually misleading, since some of the constructions seem so intact that it’s easy to form a picture of the opulence of the old roman port. 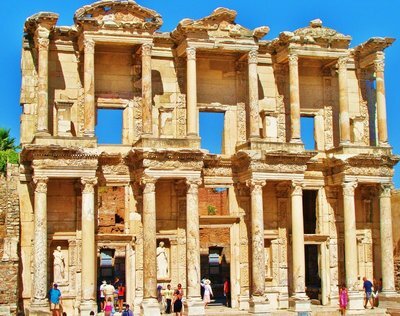 Much quieter than the ever popular Coliseum and Forum of Rome, and the dramatic Acropolis of Athens, Ephesus provides an awe-inspiring historical day out, allowing us to travel back in time and gain a real insight into how the ancients lived. There, scenes of Maximus Meridius spring to mind along with images of toga-clad characters amid exotic hustle and bustle. Vine engulfed pillars here and there shroud the place in mystery, leaving behind traces of a glorious past that has long disappeared and we can’t help but wonder what may have stood there before. Uneven stony streets and echoes of abodes may now be shadows of what they once were, but as we wander through them our minds are filled with snapshots of the past – clamorous market places offloading fresh fish and bread; bearded, scholarly men baring white flowing robes; and laurel-wreathed royals simply doing Bacchus proud. 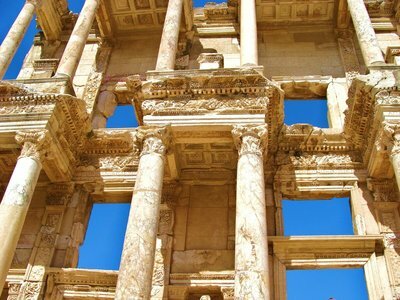 Further along, the almost flawless façade of the old roman library, set against the backdrop of a sapphire blue sky, is picture perfect, and must surely be one of the most beautiful ancient ruins in the world. And it’s easy to imagine the famous philosophers hard at work on their masterpieces if it was that they were greeted with such inspiring edifices as this. 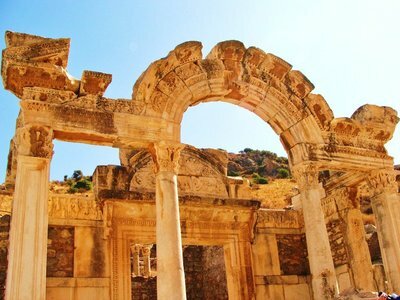 What’s particularly interesting about a visit to Ephesus, and which differs to other similar places, is that, for better or worse, we are able to get up close and personal with the ruins. There are no ropes cordoning tourists off which allows us to really experience and investigate how the city may have been in its day. Perhaps one of the best things to do in Ephesus is to climb to the top row of the amphitheatre. From there we get a real sense of the sheer size of the construction. The drama and spectacle of what must once have taken place there fill the air, and tension, glory and catastrophe still whisper in the aisles. It feels as though we are on the set of Gladiator, but it is truly incredible to think that this grand complex is real. Our imaginations run wild and we are transported to scenes of brutal battles, tragedy, euphoria and roaring crowds. Although today these crowds may come in the shape of tour groups, bum-bags and SLRs faithfully accompanying them, Ephesus has managed to preserve its grandeur. 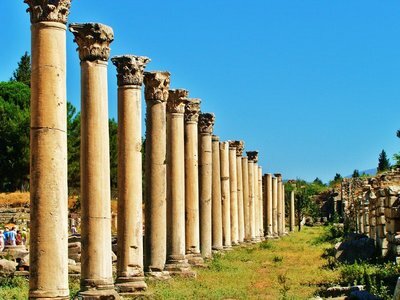 The vivid historical show offered by the ruins is awesome, and is able to bring out the Roman in all who venture to this part of Turkey.